It’s New Art West Midlands time again, when there’s a chance to see winning work selected by a judging panel from applicants who have all graduated in the past three years from the region’s art schools. This year the work is on show at Birmingham Museum & Art Gallery (until May 13), AirSpace Gallery, Stoke-on-Trent (until March 31), and at The Herbert Art Gallery and Museum in Coventry, which is so far the only space I have visited. Unfortunately there’s no work on show there by Coventry University graduates, but there is work by 10 artists out of the 28 from 130 who applied this year. They include works which of course reflect themes and changes of our times. Kerri Jayne’s work (above) called One Day features 148 framed pieces of work highlighting the overwhelming number of news items that can come at you on one day online from traditional and social media. There’s ‘real’ news, as well as fake, celebrity and life advice. They are presented in a variety of ways and highlight the claustrophobic effect this can have. Lucy Hanrahan’s work We Are The Social Media Generation also looks at the influence of social media, with a few words displayed on a big blue background-type screen, and a ubiquitous phone screen, with one eye reflected back at you. More of her work is on show at the other two venues. Lisa Kemp’s Ephemera 1, 2 and 3 (above) also looks at the bombardment of information which comes at us every day through many sources including billboards and advertising. Different sources are used to create three large boards of overlapping information, including one where the background is entirely the Wolverhampton Express and Star. Gem Douglas’s But How Is The Mouth of the Shark (top) also looks at a big contemporary concern, creating what could be an abode of a homeless person, hung with scraps of material, but also includes poetry by Somali poet Warsan Shire who has written of the plight of refugees. Maggie Shutter has used canvas in different ways to challenge the use of materials in art (above), creating Square, a piece of what looks like fabric not quite falling in a square shape, and Three Sails, brightly coloured works filling a corner. Valerija Zukova’s work is hard to look at clearly, being a work in Perspex, held together with small clips, and able to be formed into different shapes. She is questioning the variety of different types of sculpture and use of materials. Another couple of artists are featured in a corridor, and they include Jez Dolan, exploring queerness and language, with altered wording used in reports by John Wolfenden, who chaired the 1957 committee which recommended the decriminalisation of homosexuality. The exhibition demonstrates some common themes, but also the variety of work being produced in the West Midlands art colleges. The show at The Herbert is on until May 13. If you’ve never been to Wolverhampton Art Gallery to see their excellent collection of Pop Art, fear not – it’s come to you. The Herbert Art Gallery & Museum in Coventry has created, in partnership with the Wolverhampton gallery, Pop! British and American Art 1960-1975, a lavish explosion of colour in its largest gallery space. There are also a few additions from Birmingham’s collection too, including the lovely Big Red Bus, a 1962 work by Allen Jones, which features the colours and sloping shape of a speeding vehicle rushing past you. There is one work by Pauline Boty, recently rediscovered and celebrated for her contribution to the male-dominated world of pop art, Colour Her Gone, a gorgeous 1962 painting of Marilyn Monroe in which the actress is depicted as if smiling happily towards the artist, backed by flowers, and framed between two painted panels. It’s a shame there’s not a few more in the show. However there are works by major artists including Peter Blake and Richard Hamilton. There’s a work by David Hockney, a man in the shower, and quite daring for the time it was painted. There are lots of collages and prints by Eduardo Paolozzi, plus a metallic sculpture Greek Hero II, loaned from the Birmingham collection. Several Patrick Caulfields are great additions, including a 1964 representation of modern ruins, and a fantastic and very large 1971 work Tandoori Restaurant, with all the familiar items reduced to their outline shapes. The exhibition has some lengthy and very useful captions to each work to explain the artist’s background and influences, and the evolution and ideas of Pop Art, which greatly enhance the exhibition. Definitely one not to miss – and on until June 3. Take a cultural journey to enjoy beautiful creations from across the world, some of them dating back centuries. The Herbert in Coventry is showing Crafts of the Punjab until January 21. It is a wide-ranging collection of pieces from the Victoria and Albert Museum in an exhibition put together specially for the gallery, with items from the second to nineteenth centuries. Some are by craftspeople from the region, whether Buddhist, Hindu, Sikh or Muslim, and others by colonialists who depicted what they saw at the time, and whose paintings serve as a useful historical record too. The first items seen in the gallery are some lovely Buddhist stone carvings, including one from the second century depicting the infant Buddha’s first bath, plus a Bodhisattva Maitreya sculpture from the Swat Valley in the second-fourth century. There’s also a Buddha head carving from the third-fifth century. The collection swiftly moves on to sculptures of Hindu deities Krishna and Balarama, amongst others from the ninth and tenth centuries, and small and delicate carvings of figures from the Jain religion. Again there is a big jump forward in time, to the Punjab seen through the eyes of watercolourist William Carpenter in around 1856, with crowded street scenes in Lahore, and the mosque, all painted in attractive bright colours. The city in the 1860s and 70s is also depicted in monochrome pictures, capturing the mosque and the monument on the site where first Sikh Maharajah Ranjit Singh was cremated. Other photos depict 1870s Amritsar, site of the important Golden Temple which he renovated. A section on Arms and Armour includes an early nineteenth century shield with small birds and animals engraved on it, and other intricately-patterned pieces of metalwork. A textiles section includes a watercolour of various carpet designs, and some flower designs from 1905. There are nineteenth century clothes, beautifully embroidered, including one item with little figures and Muslim, Hindu and Sikh imagery combined, from 1835. Some items of furniture complete the exhibition, including wooden ones with inlaid ebony and ivory. 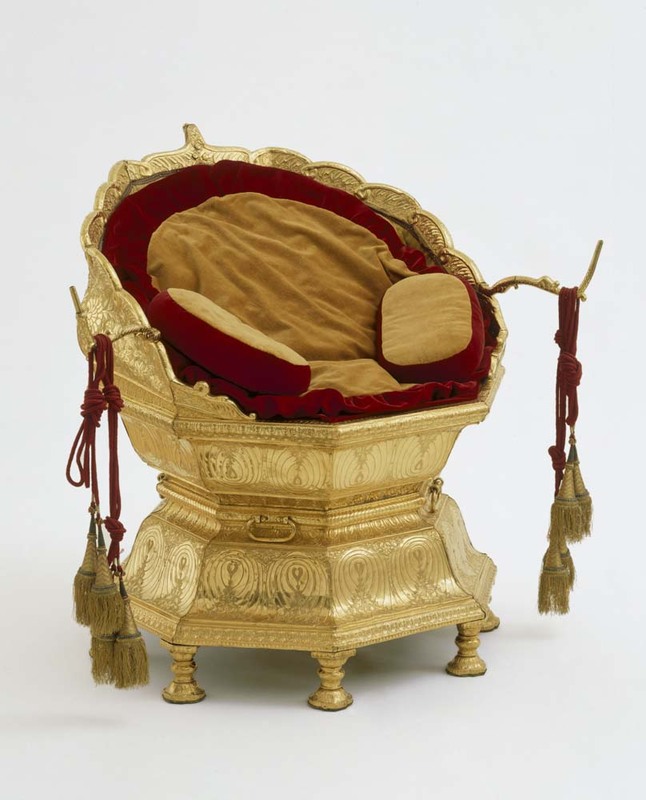 The most dramatic exhibit is the Golden Throne made for the Ranjit Singh. The exhibition briefly tells the history of the Punjab, through its ancient times, the reign of Singh, then the annexation of the Punjab to the British ten years after his death in 1839, and the fact that it’s now split between India and Pakistan. A lot of different areas of creativity are covered in the displays, which necessarily means they can’t go into depth but it’s a useful introduction to lots of art forms and types of detailed work, which could be explored in more depth presumably in the full V&A collection. A new exhibition at The Herbert in Coventry brings together some paintings from the gallery’s collection that are not regularly seen, and some loaned from major collections in London. In Face-to-Face – Portraits Through Time it’s fascinating to see paintings in particular of figures from the city’s historical past. 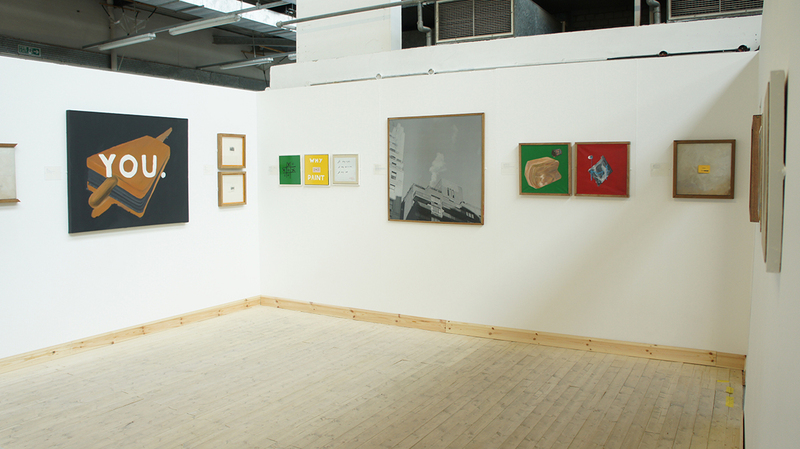 The exhibition is organised into groups under headings, though many works could really fit in several sections. In status there is a portrait of Simon Norton, dyer and former mayor of Coventry was dated 1641, the year he died and left money to Bond’s Hospital in the city, as the caption explains, and also I’ve read elsewhere to pay for a C of E minister at St John’s Church if it ever became a parish church; at the time it had been handed over to the council to administer. Amazing to see him in his rich red robes. There is also John Rotherham of the watch making family, painted with a horse and dog in 1832 by locally-based painter David Gee, really in the pose of a country gent, showing the class his family’s work and wealth meant he now aspired to. The Waters family of Coventry, behind the well-known wine business, are also depicted. Alfred Herbert, industrialist and head of the Coventry business, was painted by Leonard Boden at the age of about 90, showing confidence and self assuredness and also nonchalantly smoking a cigarette. By contrast, also from the Herbert’s own collection is Peter Howson’s Man With Cigarette, a non-realistic depiction of a hard-done-by looking man with downtrodden eyes, dragging on the cigarette, with most of the colours different shades of red. Another Arthur Gee painting shows the children of Arthur Gregory of Styvechale Hall in Coventry playing with their old dog Nelson from 1838, an idealised image of well-off people at leisure. In contrast, a Christine Vogle photograph from 1975 shows a family group in a women’s hostel, their bags still packed in a cramped room. Masterji, Coventry’s recently much-celebrated portrait photographer has a work included, Mr and Mrs Khan, a couple posing smartly before the camera. A section on commissions includes Miss Newark, but David Gee again, a young woman painted in 1859 with her hands on a book, showing her studiousness, and a Stanley Spencer portrait showing Priscilla, a young woman from Cookham depicted at home, complete with roadworks visible through the window. It was a commission from her family, painted while the teenager was undergoing cancer treatment, and died soon afterwards. 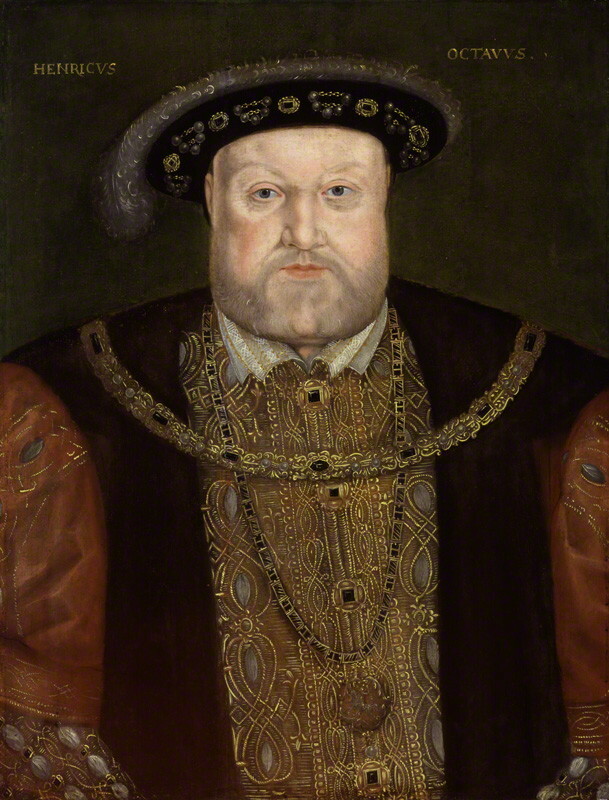 In the power section there is Bearded Man with a Falcon from 1500, on loan from the Courtauld, and showing the strong-looking central figure painted in rich colours, attributed to Lazzano Bastiani. The National Portrait Gallery has loaned a typically-tough looking Henrvy VIII, and the Herbert’s own more than life sized portrait of Queen Mary II dominates that wall of the gallery, not a very human image but showing the richness of her powerful position. 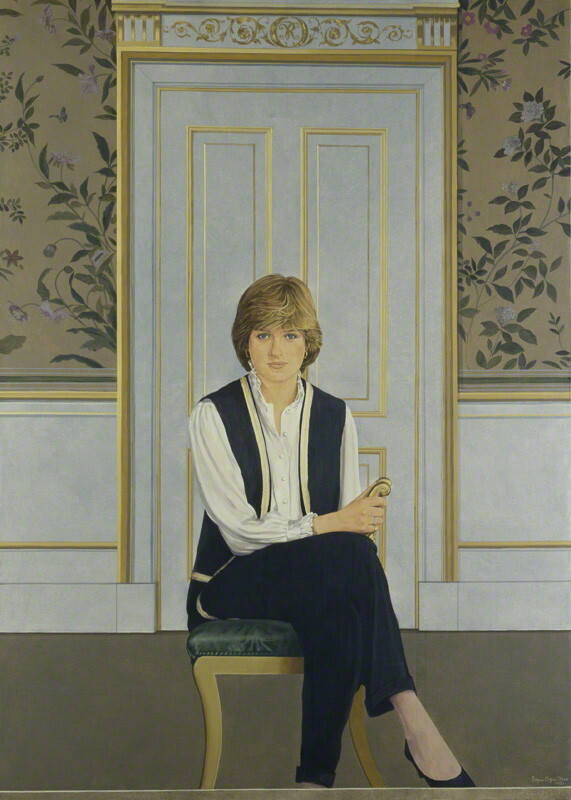 Bryan Organ’s 1981 painting of Diana, Princess of Wales, painted the year of her marriage to Charles shows her seated, central amongst well-decorated surroundings, and we are reminded it was a very different image at the time as she was seated casually and wearing trousers, representative of what she brought fresh to the royal family. The “Recognised” section features portraits of people done because the artist wanted to depict them, rather than anyone commissioning the work. It includes Giant Head of Gbenga, painted by Naham Shoa, a huge 2001-2, a large close-up portrait with the light falling on one side of his face. Coventry-based Jason Scott Tilley’s 2012 photograph of a graceful dancer in Jaipur is also included. Self portraits include Sarah Lucas’s Self Portrait with Mug of Tea from 1993, an image showing her in more traditional male pose, legs apart and dressed in masculine style. Thomas Gainsborough’s 1758-9 self portrait was painted probably while he was looking for work after moving to Bath and wanted to show off his skills at accurate representation. Victoria, a photo by Lisa Gunn, challenges images of disability and sexuality, the artist pictured from behind in her wheelchair, wearing a half-open corset. The Fame section includes an 1806 mezzotint image of Horatio Nelson on loan from the National Portrait Gallery, a picture showing him looking heroic, and distributed on his death. The Creative area includes a photo of author Jacqueline Wilson by Maud Sulter, her large silver jewellery showing her independence, and a great Germaine Greer painted by Paula Rego from 1995, traditional images of graceful or regal portraiture going out the window, with the academic in a comfortable shapeless dress, her legs splayed as she things of more intellectual things than what she looks like. 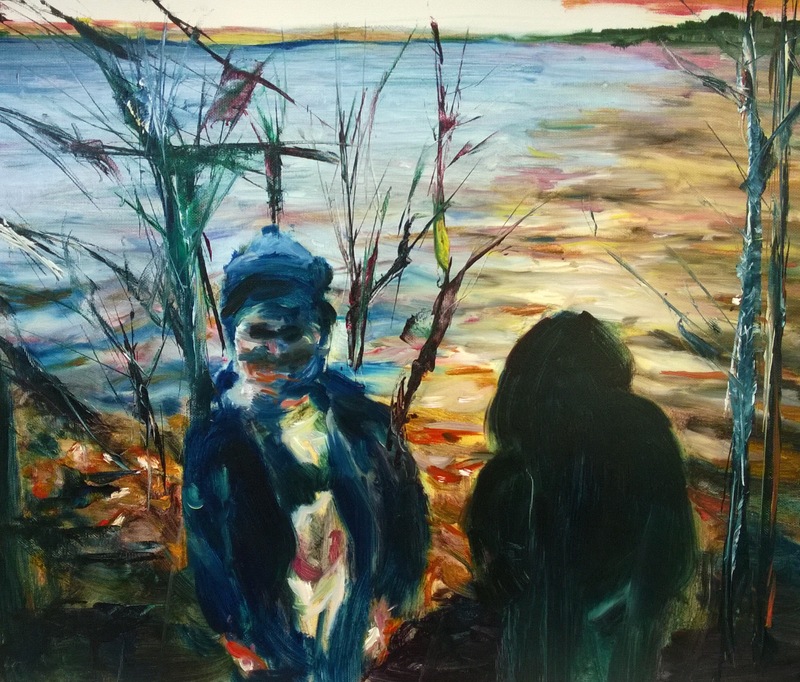 The exhibition seeks to explore an apparent age-old obsession with the human image, showing some interesting locally-held paintings which most people are unlikely to have seen before, and asking questions about why people are depicted as they are, why at all and what messages are being conveyed. The exhibition is on until June 4. An exhibition inspired by the diary of a well-known local writer aims to explore local wildlife but also has something to offer for the art lover. Between the taxidermied birds and animals in Nature Notes at The Herbert are artworks, a mixture of new ones and others drawn from the gallery’s store rooms. The exhibition is described as uncovering the natural world and investigating how wildlife adapts and changes throughout the seasons. There are things to touch and smell, with interactive activities, as well as lots of natural history specimens. The exhibition is split into the four seasons, and there are artworks along the way depicting nature throughout the year. 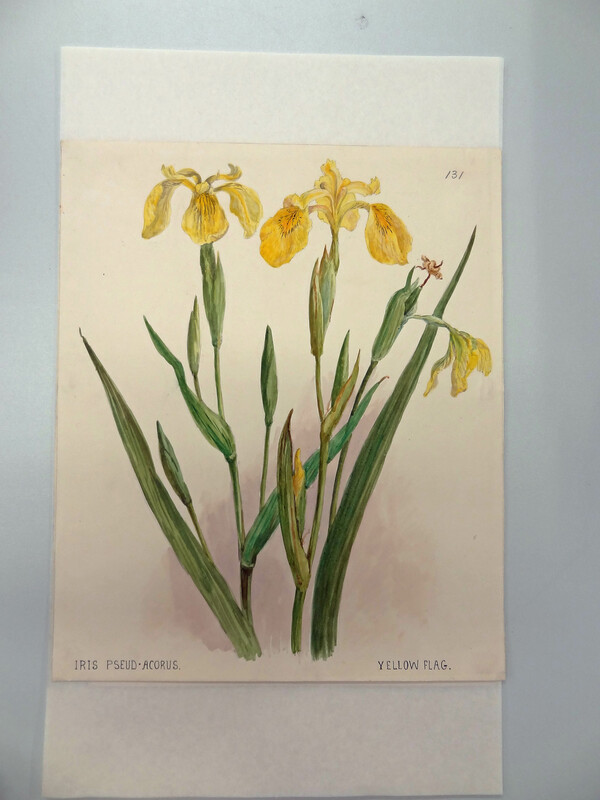 Angela Brazil, the writer of schoolgirl stories who spent most of her adult life in Coventry from 1911-1947, was also a keen watercolour painter of botanical subjects, and there are a number of her works in the exhibition. 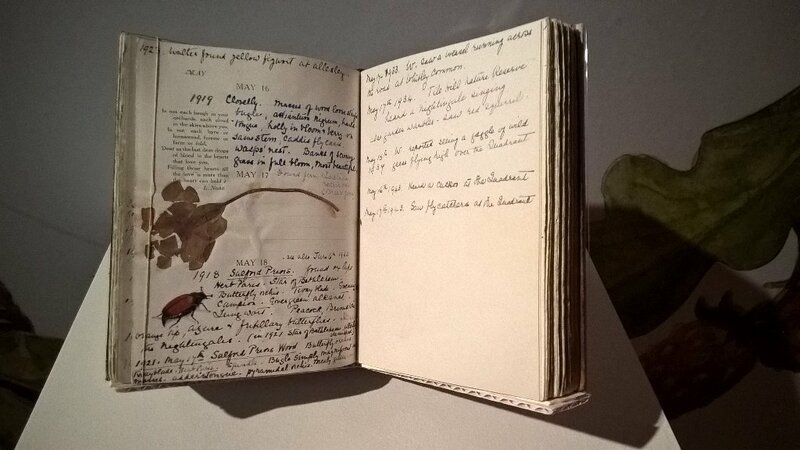 She also kept a nature diary, and it inspired the exhibition itself. Her works on show include detailed paintings of various types of fungi, wild strawberry plants, yellow iris, hawthorn, and closing with mistletoe and snowdrops. 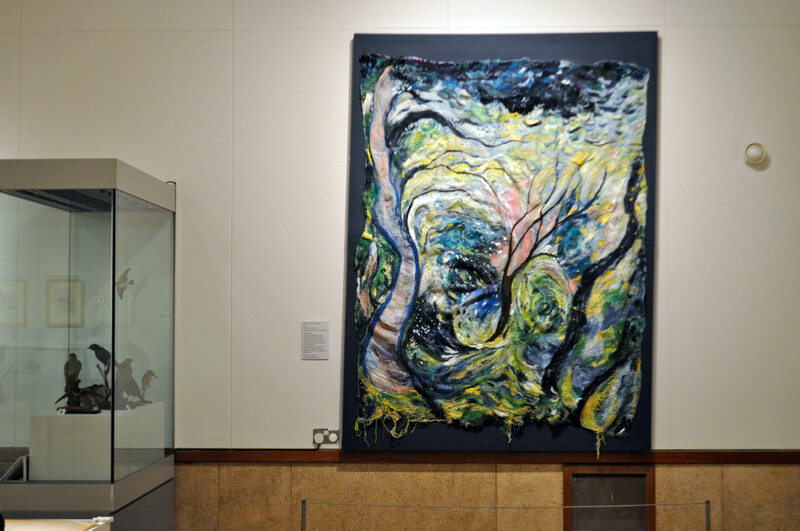 Warwickshire-based textile artist Michala Gyetvai’s large thread and fibre on wool blanket work L’après midi d’une faune work was inspired by a walk in Hay Wood in Warwickshire, and also music by Debussy and a poem by Stéphane Mallamé. It is a swirl of greens, yellows, blues and purples and looks like nature at the midst of a weather storm. Gillian Irving’s Summer 2 is a print with images on it including beetles, flies, wild and cultivated flowers laid out as on a specimen table. Margaret Taylor’s pencil drawings of buttercups and daisies are simple, clear and attractive. 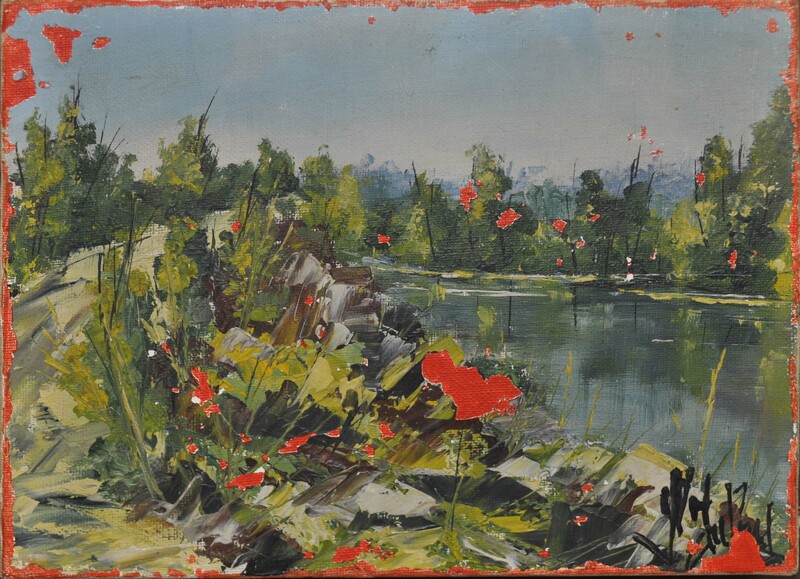 Cora Perks’s Willowherb II from 1963 is an oil painting of this early-flowering plant, and a lively mix of red and white whisps. Moving from summer to autumn, Chelsea Meadow’s lino printed paper from 2015 shows the clear lines of a fox, rabbit and mushrooms. Douglas Hatfield’s Duet or Duo is a dry point etching on paper of owls seeming to speak to each other. October in the Cotswolds is an oil painting by Wilfrid Hawthorn from 1949 of a girl walking down a village lane, with autumn rolling in as shown by some green trees and others where the leaves have already gone brown. The Pike by Coventry-based Adie Blundell is a more recent work, involving marble, ink, and wood looking a bit like a traditional stuffed and framed fish, but with drawings on it. For winter, the works include Snow in Tendring Park from 1958, a painting by Hugh Cronyn with the white snow contrasting with dark blue wintry trees and sky, painted with big splatters of colour. Herbert Cox’s Snow Scene with Hedge is a small and pleasant 1910 painting, with cottages and trees. In the centre of the gallery Orwell the Owl swoops, made by Chelsea Meadow with wings from old pieces of material, and the perch the base of a Christmas tree. Whether you find the taxidermy attractive or not there are some interesting and detailed natural and botanical works in this exhibition to make it worth visiting anyway. “My first painting in 30 years!” says Gérard Mermoz, with an enigmatic smile, referring to Paysage, which has won the Coventry Open 2016, now on exhibition at the Herbert Art Gallery. In fact, Mermoz – artist, curator and provocateur – has subjected the notion of painting and the aura of the individual work of art to multiple levels of deconstruction, with the crucial involvement of the exhibition’s organisers at Culture Coventry. The work is an appropriation – a ‘found’ painting complete with indecipherable signature, subjected to some interventions by Mermoz, chiefly with a sharp implement. For the exhibition poster, and the brochure, the gallery has severely cropped this rather small painting, converting it from landscape to portrait format. Then, in his speech at the opening Chris Kirby, director of exhibitions at Culture Coventry, called the work ‘Passage’ – a term freighted with significance. This is not so much a work in the Coventry Open, as a work involving the Coventry Open. The neo-conceptual project, with its subversion of the art object, is widely regarded as having long ago run it course. This splendid collaboration suggests that there may still be just a flicker of life in the genre. As I take a rest before throwing myself bravely into a new year of trying to balance a wine glass, note book and pen at exhibition openings, there’s time to reflect on a year of varied shows – and meeting two gallery bosses called Kate who really suffer for their art. In July, a retrospective exhibition by Coventry-based artist Nancy Upshall was my first experience of the Deasil Art Gallery in Oxford Street in Leamington. I talked to Nancy about her artistic career and paintings made in Coventry from the 1950s onwards, and also Kate Livingston and Kate Bramwell who run it. Openings at Deasil are always fun, and Kate B welcomed me to one, when she had her hands full, by inviting me to pour my own Prosecco and “fill it to the brim” – a girl after my own heart. The exhibitions I’ve enjoyed the most have been Nancy’s and also Inked Palette, which brought a new audience to the gallery, as it showed works by people who normally work as tattoo artists. The two Kates really showed their commitment to their work at that exhibition, as each got a tattoo live at the opening – I’m glad to say I’d left by that point, though Kate B has an artist’s palette on her abdomen and Kate L a letter on her leg as a memento of it! Earlier in the year, Gallery 150 bowed out of its central space in Leamington after Englandia, an exhibition by former Coventry University lecturer John Yeadon, an investigation into England’s national identity which John said doesn’t exist. I met up again with John at the Hunger Meal at Coventry Cathedral, organised by Artspace’s City Arcadia project, where we were among the naughty children, including Dean John Whitcombe, who didn’t join the organised conversations, but still enjoyed the talk and food enormously. Rugby Art Gallery started the year in uncertain silence, with the Rugby Collection making an earlier than normal showing, including some new additions to the collection. Its later Open, fairly predictably inspired by the Rugby World Cup, was a bit disappointing but The Gain Line by Ravi Deepres was a mesmerising film which held my attention thoroughly, partly through merging local scenes from the town with a game at a huge venue. The Mead Gallery at the University of the Warwick began the year with some fascinating Russian photographs from the early twentieth century, and by five contemporary photographers. And, not usually a huge fan of film installations, I was blown away by The Unfinished Conversation, a three-screen installation by John Akomfrah about cultural theorist Prof Stuart Hall. The summer exhibition focused on the Mead’s own collection, now in its 50th year. It was an excellent chance to see together works which are generally spread around the university. I was also lucky enough, on a beautiful bright day, to be invited to the installation of a new work by David Nash at the University of Warwick’s Diamond Wood, accessible from the Coventry to Kenilworth cycle route and walkway. I talked to the artist as the work was painstakingly winched into place and David positioned it down to the last millimetre. It’s called Habitat and the idea is that local wildlife such as bats, birds and insects will use it; I must return to see how it’s bedded in. The Mead’s final exhibition of the year, Making it: Sculpture in Britain 1977-1986 was a thorough and educational exhibition about the works in this period, but my overwhelming feeling afterwards was that this wasn’t the most interesting period of sculpture by a long way. Nuneaton’s Museum & Art Gallery does a valiant job in staging two or three exhibitions at the same time, and it continued to show some small and interesting ones this year, including some inspired by works left to the museum. It started the year with an exhibition of miniatures, which revealed some lovely works by Lady Stott, who’d lived an interesting life. A later exhibition of works by Jhinuk Sarkar was inspired by a collection of items owned by Canon John Turner during his time as a missionary in Baffin Island early last century. It’s amazing where these things end up. Other good shows there this year included urban landscapes of Coventry, Nuneaton and Senegal painted by Sarah Moncrieff, and cartoons by Nuneaton-born professional cartoonist Noel Ford. The White Room in Leamington continued to lay on fun opening nights, packing people, wine and nibbles into the small but perfectly formed gallery space. The Lanchester Gallery had been in the prominent and easily accessible spot on a corner in Jordan Way in Coventry for the last couple of years, and flockOmania, which combined giant jewellery and performance, was one of the oddest. It’s a shame it’s now back inside the far less accessible art school building on the corner of Cox Street. The RSC in Stratford continued to surprise with some good exhibitions, including one about Bruce Bairnsfather, the Warwickshire-born wartime cartoonist I had never heard of but was fascinated to learn about. Works by Jade Blackstock, Michael Carr and Jennifer Shufflebotham in New Art West Midlands. New Art West Midlands was challenging, not least to me when I found myself shut outside Birmingham Art Gallery & Museum desperate to get in early before a drive to Colchester (don’t ask). Thankfully PR Helen Stallard rescued me and it turned into a fun opening, with chats to several lovely artists including Michael Carr who I kept running to at exhibitions throughout the year. Compton Verney had what felt like a good year, starting with an exhibition entitled Canaletto: Celebrating Britain, which showcased his paintings from 1746-55, and I was glad to have attended the official opening and heard gallery director Dr Stephen Parissien put them in their artistic, social and historical context. Warwickshire-based artist Faye Claridge’s Kern Baby was on show outside all season, a five metre-high faceless, gowned creature, inspired by some Benjamin Stone photographs, with some of her admittedly “edgy” photos inside. I described Kern Baby at the time as looking as though she’d escaped from the building. 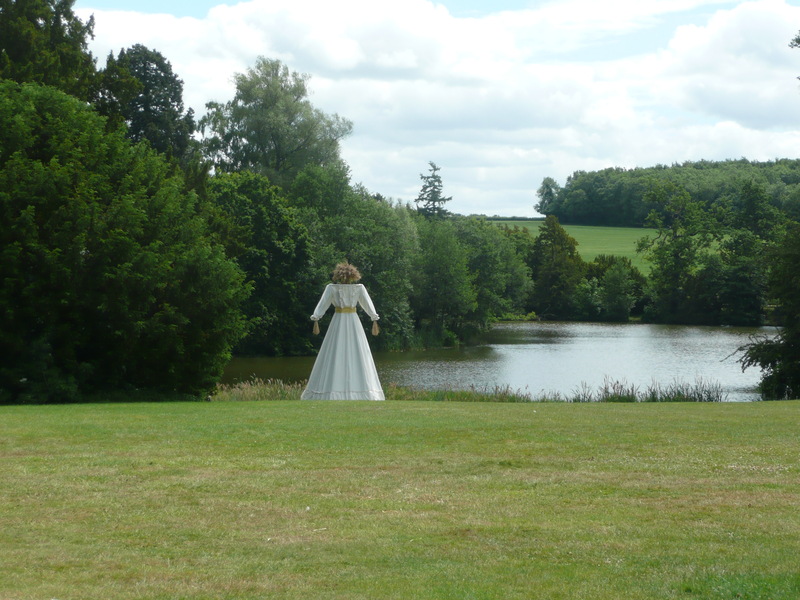 Months later I visited to find her down by the lake; apparently her prominent position – great as an art work – didn’t go down so well with the venue’s wedding business and photo opportunities. Kern Baby’s second position, by the lake. The Chinese Collection enjoyed a big revamp after winning funding, and it made a huge difference, showing the importance of the collection rather than just being on a route between galleries. Leamington Art Gallery & Museum held A Leamington Lad brought together lots of works by Terry Frost, 100 years after his birth in the town. It was brought to life by some recordings of interviews with the characterful Frost. Later in the year I chanced upon another Frost exhibition in Banbury, Frost, Family and Friends, showing works loaned by individuals rather than galleries, and the often personal stories behind them. The works were mostly smaller and not all in Frost’s usual style, which made it fascinating; it’s on until January 9 so there’s still time to see it. Recording Britain at The Herbert was a V&A touring exhibition which showed the country in 1939 captured by artists of the time, and many lost scenes were recorded; it was poignant though that not all were lost in the war, some were drowned under reservoirs or lost as industries declined. The autumn season of remembrance at the Herbert included work by contemporary artists, but seeing John Piper’s paintings of the city the day after the Blitz were most memorable. Away from my usual round of galleries, there were some other gems. A photographic exhibition at the Belgrade Theatre showed the works of a class of 11 adults studying for City and Guild Level 2 Photography & Photo Imaging at City College, and included some really good works on the theme of city life. 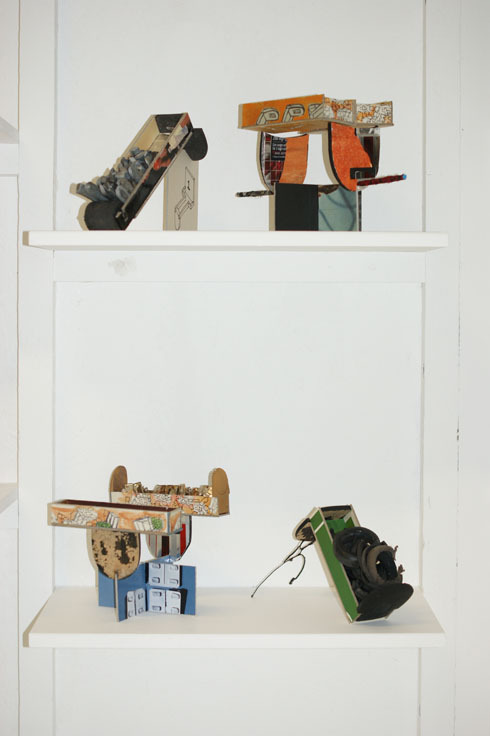 A skateboarder by Tony Skipper in the Belgrade Theatre exhibition, and a John Blakemore from Imagine Hillfields. Imagine Hillfields was an exhibition which came from a research project, and brought together works by contemporary and historic photographers depicting Hillfields. 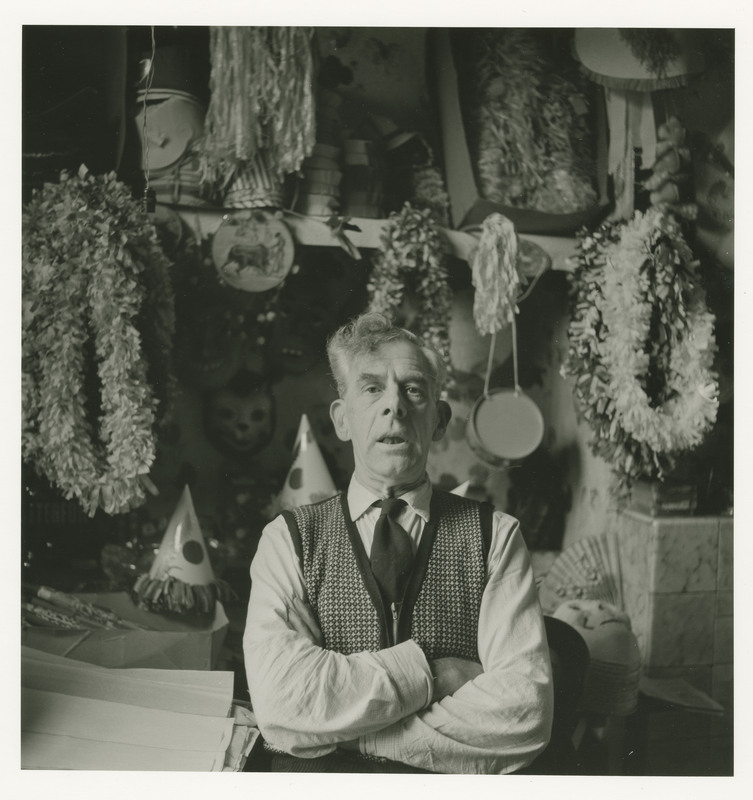 Jason Tilley had created new portraits for it, Richard Sadler had documented his grandmother’s life in the 50s and Masterji had documented South East Asian families through the decades; but the most astonishing, by John Blakemore from the 1960s hadn’t been seen before. The bleakness of some of the images was at odds with the fizz-fuelled and fun opening. Lucy Cash presented a film installation in Gosford Books in Coventry city centre as part of the Dance and Somatic Practices Conference 2015 which was being held in the city; about two people could squeeze in to view it at a time. In the Michael Heseltine Gallery at Middleton Cheney near Banbury, Coventry artist George Wagstaffe, known for his sculptures, held his first painting exhibition at the age of 80-plus, and it was interesting to hear about how Pre-Raphaelite women he’d seen in paintings in Birmingham around the time of the Second World War were influencing him still. I discovered CRW Nevinson at the Barber in Birmingham, and loved his attitudes and mix of futurist and cubist styles; the gallery showed German Expressionist prints at the same time, works which were derided by the Nazis and can be appreciated now for their honesty and power. On London visits, I discovered and enjoyed the art galleries at the Imperial War Museum. My first visit to Bilston Craft Gallery was to see Bilston’s Happy Housing: Otto Neurath’s Vision for Post-War Modern Living, an examination of the plan for homes that would actually make people happy, and what happened to that inspirational idea. There was an exhibition of photographs as part of Coventry University Romani Week in April, with an introductory talk by the late Deputy Council Leader Phil Townshend, who spoke passionately about the city’s dedication to community cohesion. On a trip to Cornwall, I was amused to find lots of koans (you know, the pointy thing in front of the Warwick Arts Centre) on show at the Tate St Ives as part of a show of Liliane Lijn’s works. I didn’t get to London often this year but was very glad to make it to Ai Weiwei’s exhibition at the Royal Academy; I had thought he was more interesting as a person and campaigner than artist, but seeing lots of his pieces together made me revise that view – the personal and the political merge to create really great works. An exhibition of portraiture by Giacometti found me also having to look anew at works more on paper than in clay by one of my favourite sculptors. One of the oddest art experiences of the year was the Art Trail run as part of the Earlsdon Festival, where I paced the streets looking for some elusive art works. It was something I felt could grow and be improved upon in 2016, but with the Earlsdon Festival now not happening perhaps it won’t go ahead at all. Anyway – thanks for the art, the laughs and the gossiping in gallery corners this year – and looking forward to what 2016 will have to offer! New Art West Midlands is in its third year and getting your work into it is a prestigious draw for recent art graduates – last year 100,000 people are said to have visited the exhibition across three galleries. This year there are four involved – the Herbert in Coventry, Birmingham Museum & Art Gallery, Wolverhampton Art Gallery and the Barber Institute of Fine Art, showing the work of 30 people in total. All have graduates in fine art from one of the West Midlands art schools in the past three years, with successful works chosen by artists John Newling and Bedwyr Williams, and art historian Amna Malik. There are four Coventry University graduates showing in the exhibition, and I spoke to them at the opening in Birmingham. BA in Fine Art graduate Jennifer Shufflebotham’s work (top) had already been recognised before she was also selected for New Art West Midlands. She was offered a residency at the Pod in Coventry after her degree show last summer. At the Birmingham gallery she I showing two paintings inspired by a box of slides she found in her grandparents’ attic in Burton on Trent about four years ago, showing family holidays in the 1960s, when photography was more of an effort than today when people can take pictures by taking their phone out. She has re-layered them to create paintings, with blurred and slightly strange images produced. Foremark Reservoir II is particularly interesting, with one person reduced to a dark shape which could be deliberately cloaked. 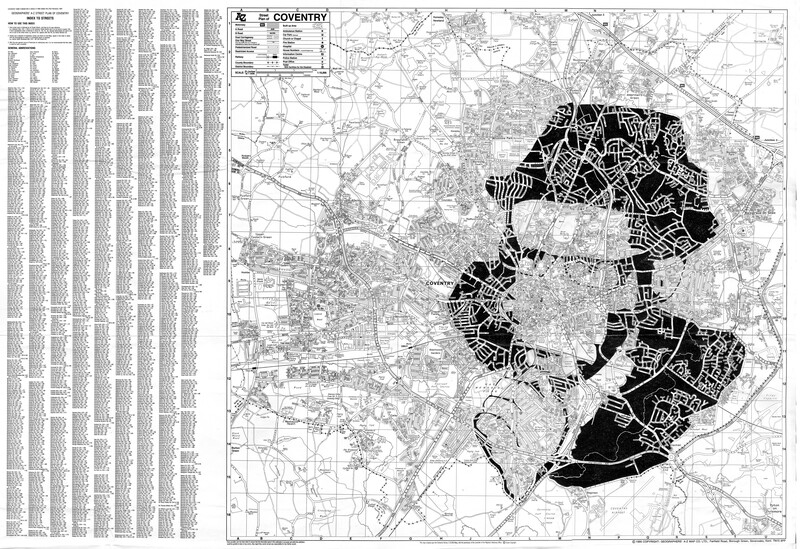 Michael Carr’s work includes Instructions Not Included, a screen print of the instructions for looking after a vinyl disc, and A Message To You Rudy (above), a digital ink work showing Lynval Golding from the Specials depicted on a street map of Coventry. If you pick up the exhibition leaflet you get your own copy of this. Michael came into the world at the Walsgrave Hospital in Coventry and said music of the Specials had been “a big influence on my life”, and puts the work in the context of “a vision of psycho-geography and how music can motivate and change lives and people”. Michael has just finished an MA in Contemporary Art Practice but his undergraduate degree was in graphic design, and he hopes to get a studio and have some links to the university still. I’d already seen his work at a couple of exhibitions in Coventry, showing he’s getting out there already, and with his energy and enthusiasm he’s sure to go places. Reece Kennedy’s work was inspired by talking to his Coventry University tutors about art education, studying, and the student’s audience. He chose to capture the paradigm of the art fair by creating an installation of a room from the Frieze art show entitled Greatness Engine Future Prospectus (above). Reece graduated with a BA in Fine Art and is running his own printing business in Birmingham. 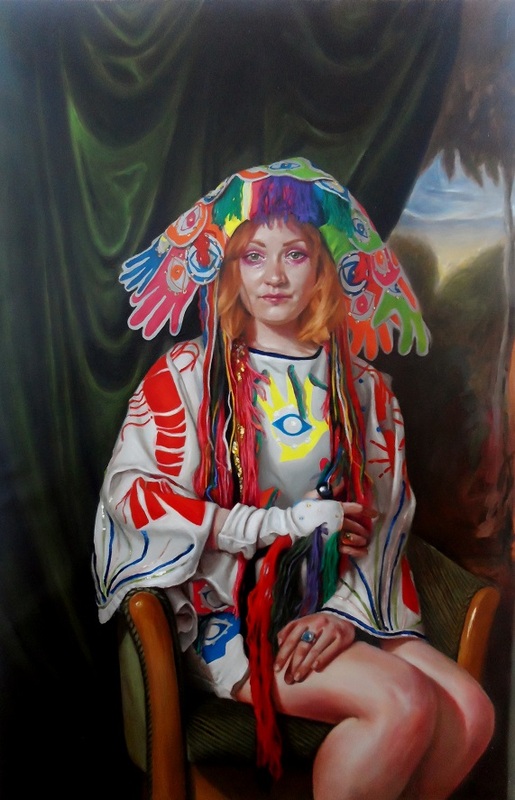 Other works on show at Birmingham Art Gallery & Museum included Emily Sparkes’s self-portrait in a colourful costume, Ode to Christian Joy (above), and she also has some paintings on show at the Herbert of Pearly Queens, relating to cross dressing and gender roles. They are interesting and keep the attention. James Turner’s reworking of paintings from the gallery’s collection sees beams of light coming from the painted women’s eyes, distorting how they are viewed and turning them into light box works. At the Herbert in Coventry, Andrea Hannon is showing her installation works. Housekeeper is a lightshade with things hanging from it, and Territory Formula features flowered wallpaper and cut outs of women from magazines. Puppeteer includes more cut outs, an old framed mirror, and little character cut-outs, including a Victorian woman. Coventry born and bred, Andrea has recently completed a Fine Art PhD at Coventry University. 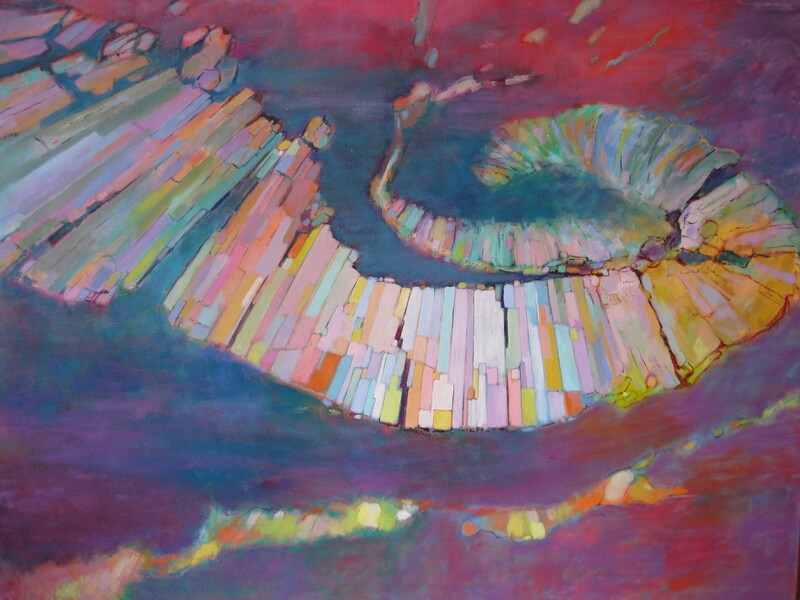 She used to do large paintings, but has now moved into multi-media installation and collage works. She uses a lot of magazine and encyclopaedia images, and this set of work is based on the idea of what it means to be the ideal woman, as seen through the media, being good at cooking and housekeeping. Andrea has now moved to live near Stratford, and is teaching at the college there and working with some other former Coventry University students. 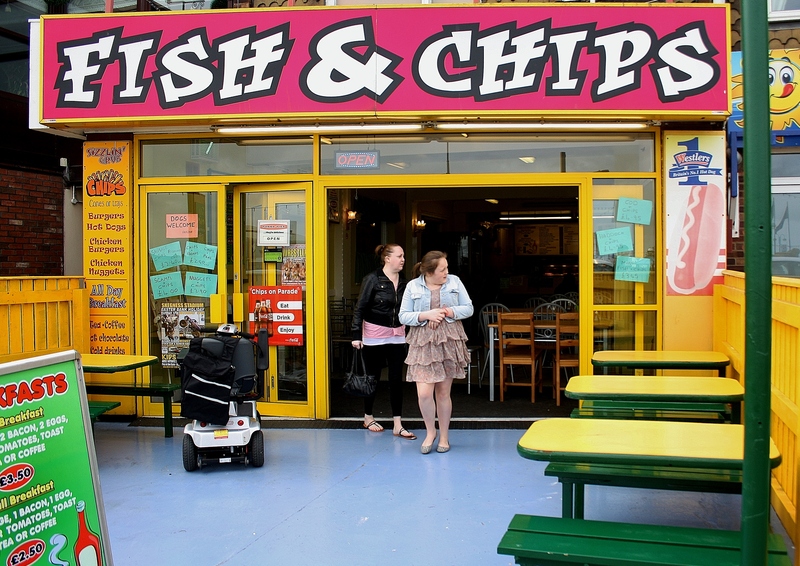 Also at the Herbert are varied works including Megan Sheridan’s documentary-style photographs depicting British people on a traditional seaside holiday (above), or having lunch on the grass in Birmingham’s St Philip’s Square. There’s also an intriguing video from Jade Blackstock entitled In, In, In (below), in which she wears white and paints her skin white and is then sprayed with white liquid foam, an unpleasant claustrophobic experience which aims to turn ‘white’ from an adjective to an actual object. I’ve visited two of the galleries and at first sight haven’t been as impressed overall with the selection as last year. Maybe that’s because there’s nothing as stand-out impressive as Lucy Hutchinson’s masks and wallpaper, James Birkin’s paintings, or the transformative sculptures of Sikander Pervez, who is currently exhibiting at the New Art Gallery, Walsall, after being selected for a solo show. But only time will tell whose work from the 2015 exhibition we will be seeing more of on a larger stage. *New Art West Midlands is on at Wolverhampton until April 26, both the Birmingham galleries until May 17 and the Herbert until May 31. Visitors to the Herbert might wonder why a rather basic-looking shed has suddenly appeared upstairs on the landing. But it’s a well-travelled shed which has already had several lives as an art gallery, and has re-emerged from artist and curator Lorsen Camps’s Coventry garage for this outing. The shed is officially known as the Coventry Centre for Contemporary Art, and was taken over by Lorsen after it was used in the Bob and Roberta Smith installation at the Mead Gallery in 2009. Its first appearance was then in the grounds of Earlsdon Primary School, showing an exhibition of found objects by Lorsen, plus Martin Green and Joanna Rucklidge. The three are reunited for this Herbert exhibition. 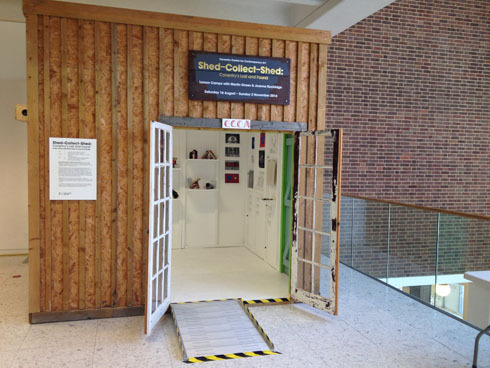 The show is called Shed – Collect – Shed, playing on the different means of the words, but Lorsen explained the idea is to explore the relationship between their own found objects, and the Herbert’s collection of Coventry-related pieces. Lorsen said: “We are bringing found objects which are the collection of three artists into the museum setting and starting to play with ideas of what the Herbert specifically does. I met with the Herbert’s collections curator Paul Thompson and he was explaining the Herbert collects Coventry’s identity and that was quite interesting. 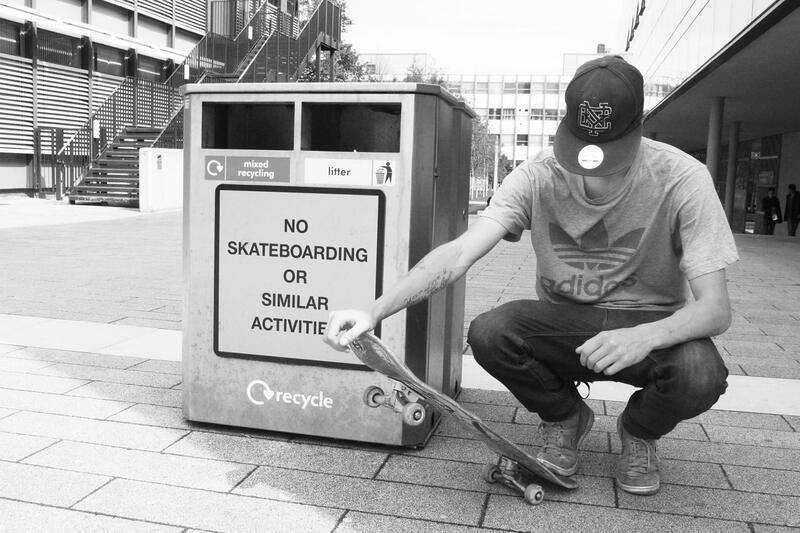 Martin and Lorsen also took a trip to one of Coventry’s twin cities, Cork, to create some of the works in the exhibition incorporating photographs and found items, Paradise Disregarded, Paradise Reclaimed, which also uses things found in the Paradise area of Coventry. They include clips and tiny pens, plus against a Gothic-type image there’s a spooky white eyeless doll, plus a black plastic avenging angel. Joanna visited Coventry in June and said she ended up with aching thighs after bending down at least 200 times to pick up circular items she wanted to use in this exhibition, noticing a theme from Coventry and its history. She found all her pieces on four circular walks on one day in June, and has used them in various ways. 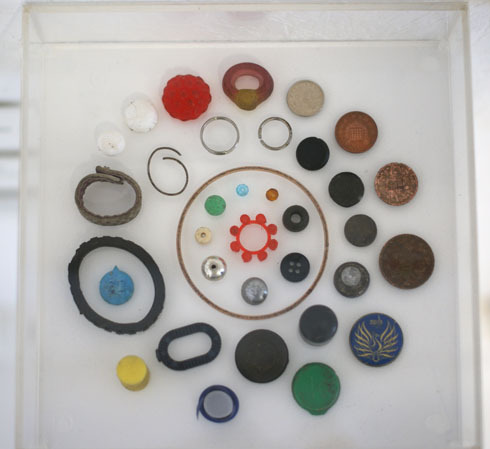 They are displayed in similar groups, such as clear bottle lids, and metal bottle lids, some just shown and others in colourful screenprints on paper. 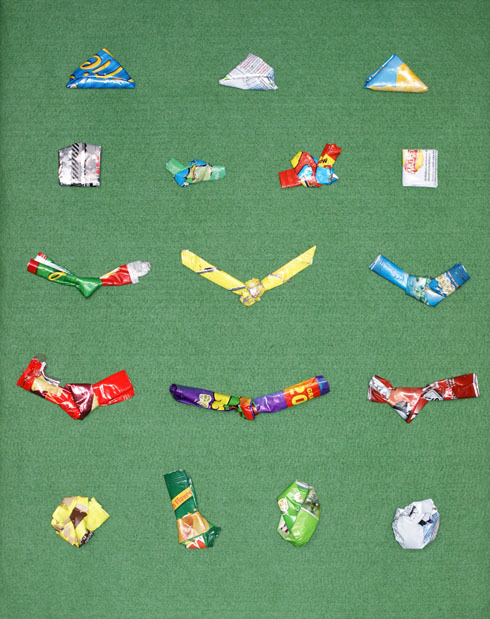 One item, My Fond Knotted Crisp Packet Collection (below), is deliberately like an old-fashioned display board of butterflies pinned to a cork board. A display of Mini Beasts includes plastic animals and toys, a special interest of Lorsen. Standard Triumph uses a row of matchboxes to show small plastic toys. A window frame has been turned into a modern-looking lightbox display with a sea horse air freshener and hairband around it. Another item is an old found wooden door with small, colourful items stuck neatly to the back of it. Another consists of boxes with bits of jewellery and other sparkly items in them. A found fridge shelf is used to frame a collection of pens and pencils. Easy to miss, over the door are some trophies, a swan statuette and a plastic flying bat, both in gold-sprayed frames which on closer inspection come from the polystyrene packaging from white goods. Each box is held up by a shoe heel found by Martin, or a stand made by a cigarette packet, colourfully wrapped with material from a found umbrella. There are different things in each one. They include wheels from suitcases, zip ties, rucksack buckles, bits of lighters, wheel weights and sunglass lenses. There is also a DVD slide show with images of 100 items in situ flashing up on the wall outside the shed. * The exhibition is on until November 2.